1 Dior ‘Nail Glow’ – A slightly pink nail polish that enhances the natural colour of your nails to give them a light, healthy sheen. 2. St Tropez Self Tan Luxe Dry Oil – A moisturising non-greasy formula that gives a long lasting natural looking tan. 3. Laura Mercier Body Butter in Almond Coconut Milk – I always associate the smell of coconut with summer and this body butter is the ultimate in luxurious skincare. 4. Viktor & Rolf Flowerbomb La Vie En Rose – A lighter version of my favourite fragrance that comes in a bottle “inspired by the iridescent wings of a butterfly”. What’s not to love? 5. Nars Matte Multiple in Anguilla – A non-sparkly version of the cult cheek & lip stick in a selection of vibrant and sun-kissed shades. 6. Clarins Rouge Eclat in Juicy Clementine – The perfect lipstick for fair-skinned people like myself who want to embrace this summer’s trend for orange lips. Plus the name reminds me of my lovely daughter! 7. Mac Prep + Prime Highlighter – A pen-style highlighter that can be used over or under makeup to add radiance and a sheer wash of colour. 8. 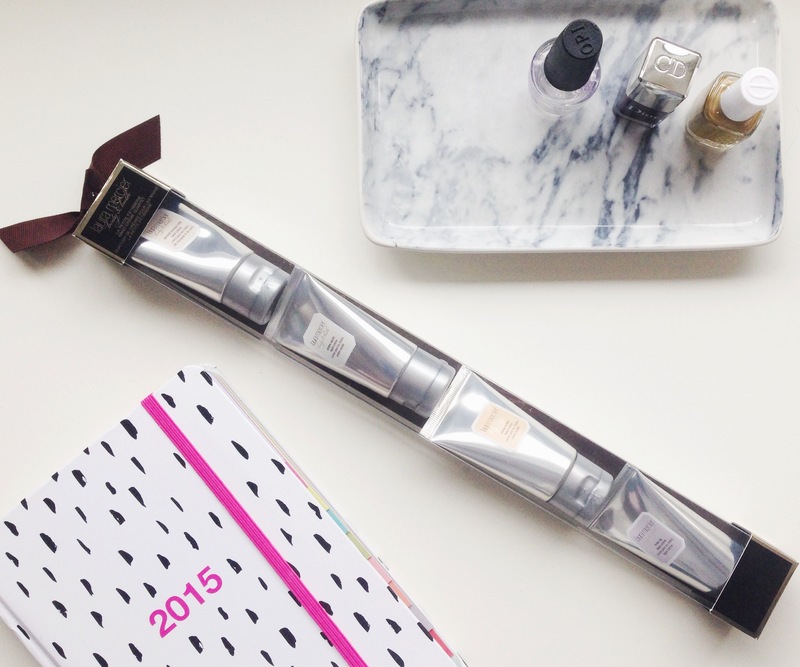 Ghd White Eclipse – I know it’s not great for my hair but I use my ghd hair straightener every day. This new version promises to style your hair in a single stroke while actually making it stronger. The arrival of summer here in the UK is always sudden and usually unpredictable, even for the poor weathermen. Last weekend we had glorious sunny weather, culminating in the hottest day so far this year on Monday. It is always wonderful when we get these sudden heatwaves, short as they may be, but I have to admit that the prospect of putting my lily white limbs on display didn’t have me jumping up and down with joy. 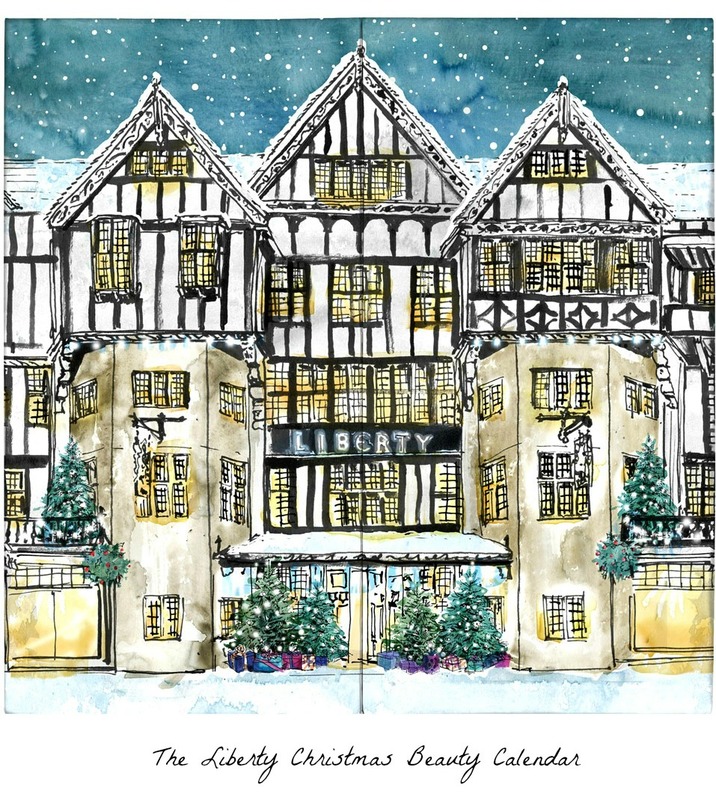 But a quick trip into town and a rifle through the shelves in John Lewis’ refurbished beauty hall (I was very impressed – lots of new brands to try) and I was ready to transform myself, if not exactly into a bronzed goddess, at least a less ghostly version of myself. 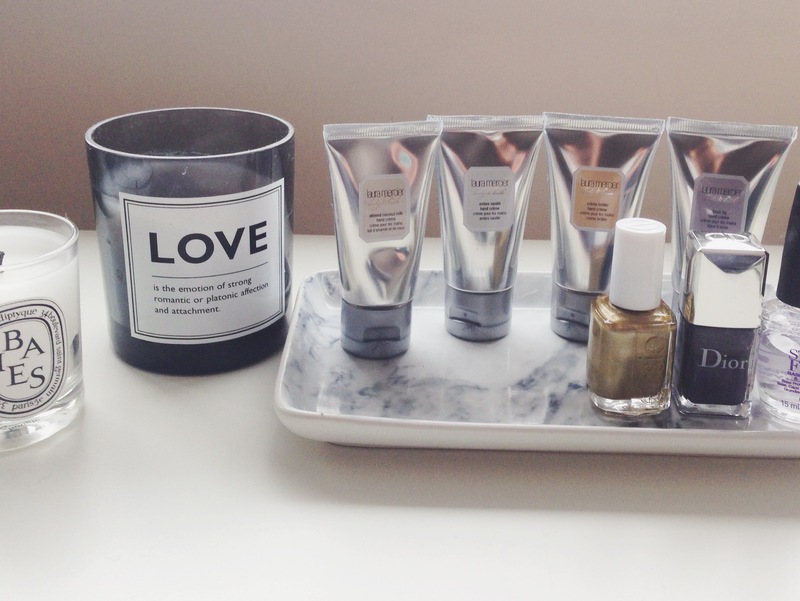 Being a low maintenance girl, I’m all for keeping it simple and not over complicating things with too many products. A good exfoliator is essential – I normally use the Soap & Glory one but this Exfoliating Body Wash from Australian Organics worked just as well. When it comes to the self tanner I prefer a mousse as it’s easier to apply and you can see which areas you have already covered. Fake Bake has been my go-to brand for the last few years as it gives a nice subtle glow rather than a “I just spent a week in Barbados” deep bronze. I first bought a St Tropez tan applicator mitt last summer and now consider it a must-have to ensure an even finish, free of streaks and product build-up. Add in a nice summery nail polish in ‘No Room for the Blues’ by OPI (pictured here with the Start to Finish all-in-one base coat, top coat and strengthener – a great multi-tasker if there ever was one) and I was ready to face the sunshine which lasted all but four days. Oh well, that’s the British summer for you! A Good Night’s Sleep – four little words that are the holy grail for most parents with small children. Personally, I can count on one hand the number of uninterrupted nights’ sleep I have had in the last decade. It is one of the greatest fallacies of parenthood that once your babies sleep through the night, they will carry on doing so until they grow up and leave home. Or at least that hasn’t been my experience. My eldest son finally started sleeping through most nights when he was six, at which point I decided it would be a really good idea to have another baby! I’m lucky in that, as long as I go to bed before midnight and don’t drink more than two glasses of wine, a lack of shut eye doesn’t bother me too much (unlike my husband who is not, shall we say, at his most sparkling first thing in the morning). 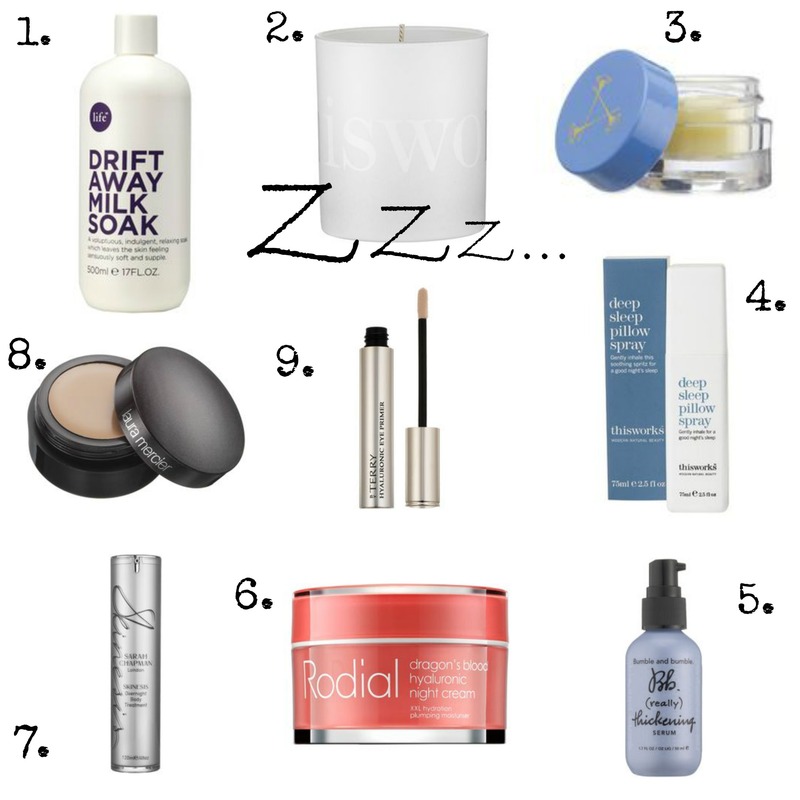 The effects the lack of sleep has on my skin is another matter though and I’m constantly on the look out for new products to boost my arsenal against the sleep thieves (a.k.a my children). 1. A relaxing soak in the bath is a nice way to unwind before bedtime. This indulgent Drift Away Milk Soak by Space NK contains ingredients which have a calming effect on busy minds. 2. The Deep Sleep Heavenly Candle by This Works has notes of Lavender and Camomile to soothe your senses. 3. Promising to ensure “a blissful night of slumber” this Deep Relax Balm by Aromatherapy Associates is the most luxurious sleeping pill I’ve ever seen. 4. Squirt This Work’s Deep Sleep Pillow Spray on your pillow and let its soothing scent of Lavender, Vetivert and Wild Camomile send you off to the land of nod. 5. You can actually improve your hair while you sleep with the Thickening Serum from Bumble & Bumble that works overnight to give you thicker, fuller hair. 6.The name alone was enough to draw me in: Dragon’s Blood Night Cream by Rodial promises a smoother, brighter, more even complexion by the time dawn breaks. 7. The Overnight Body Treatment by Sarah Chapman is packed with potent anti-ageing ingredients and relaxing essential oils. 8. If all else fails, hide the dark circles with Laura Mercier’s Secret Concealer and take comfort in the knowledge that at least you look well-rested. 9. Or plump for By Terry’s Hyaluronic Eye Primer which promises to erase sleepless nights by reducing puffiness and lifting fine lines. Happy Sunday my lovelies! 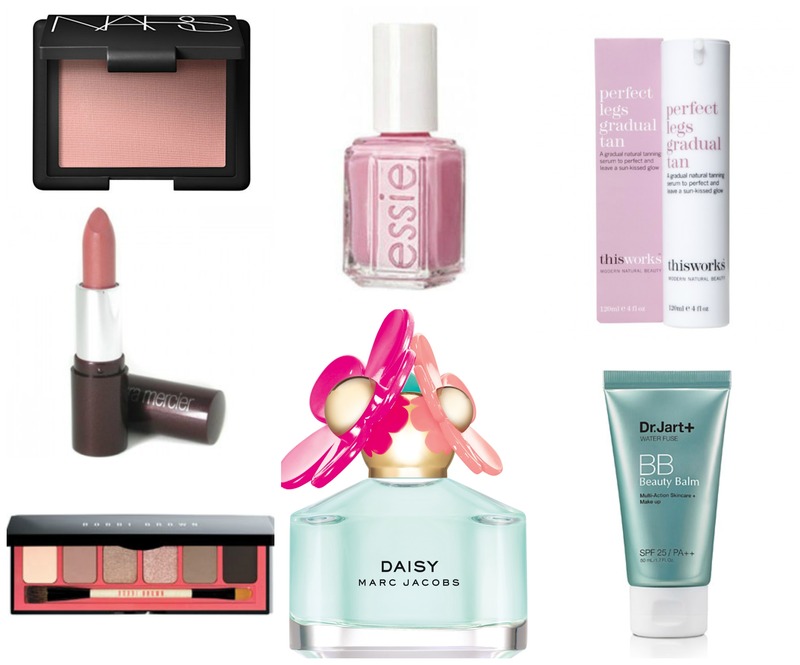 It is party time in the blog world today thanks to the fabulous Clarity and Ellie over at Beauty Stalkers who are hosting a Fashion & Beauty Spring Essentials link party. Below is my contribution and when you’ve finished reading, head over here to join the party and celebrate the first weekend of spring! Here in the UK the arrival of spring tends to be gradual, with a chill in the air that can linger until May (or longer if we’re unlucky..) so it’s all about making subtle tweaks to welcome in the new season, rather than baring it all. 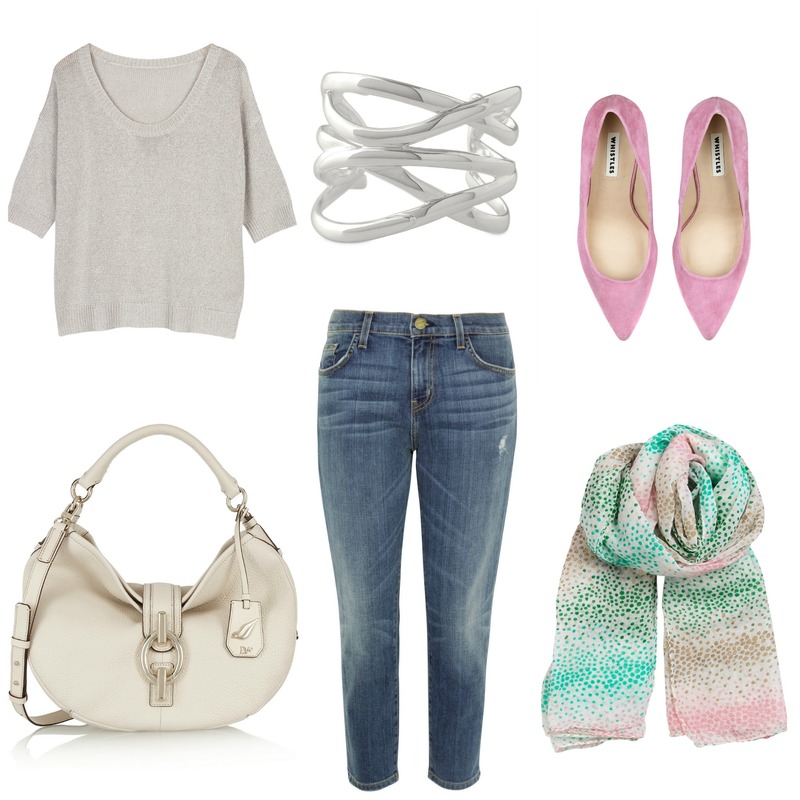 Cropped jeans, 3/4 sleeve lightweight knits, and accessories in lighter neutrals and cool ice cream colours are the order of the day for me. 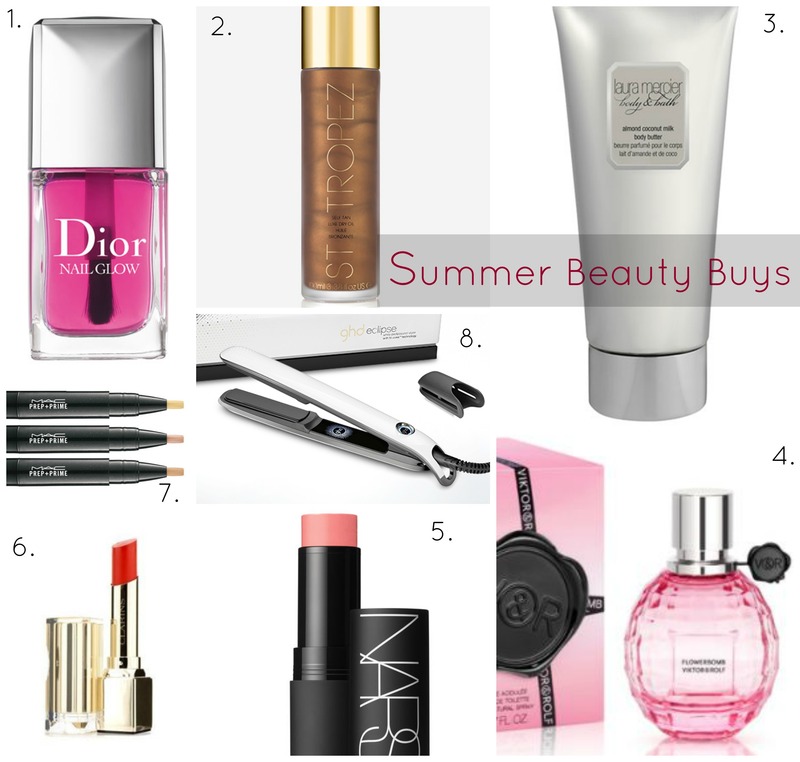 Make up needs to go lighter as well with a sheer base, pastel nails, neutral lips and eyes, and a touch of peach blush. Switch to a summery scent like Marc Jacob’s Daisy Sunshine edition and start prepping your pins for warmer weather and you’re good to go. Pretty much all my skincare products had run out so I desperately needed to restock on everything from cleansers to moisturizers. While I was happy with the Verso serum and day cream I was using before, I’m not exactly what you would call a loyal customer when it comes to beauty products. So I walked into the shop with a very open mind, ready to heed the advice the experts had to offer. 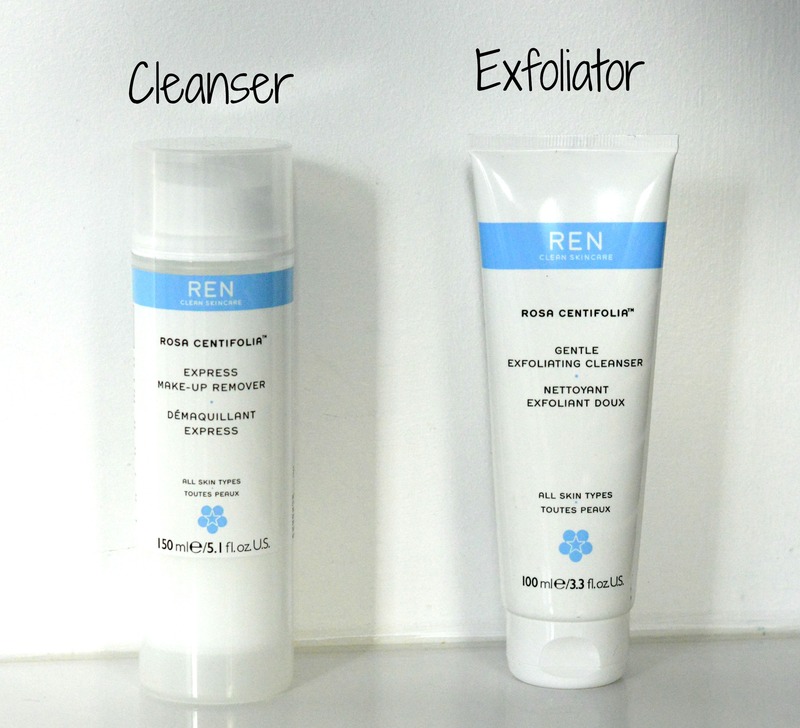 One product that I did re-purchase was the Express Makeup Remover by Ren as it does such a thorough job of removing all traces of makeup (including my waterproof mascara) and saves time on using a separate eye makeup remover and cleanser. I also bought an exfoliator by the same brand which is gentle enough to use every day. 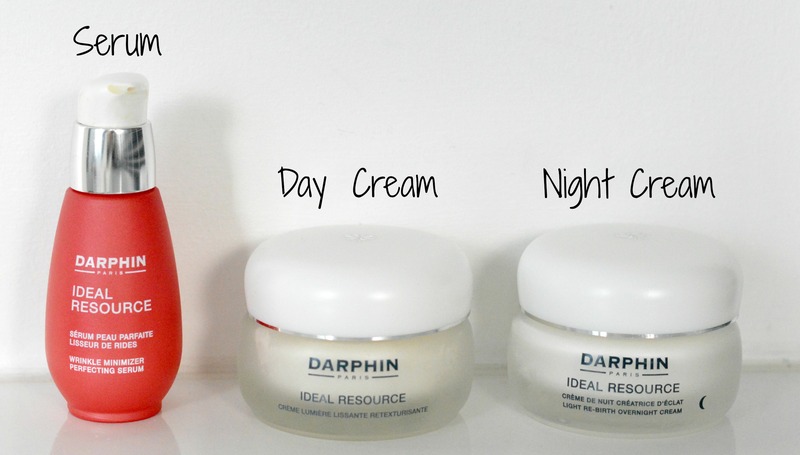 Here’s a new brand for me: Darphin. As the name would suggest, it hails from France and the blurb says it is “a professional botanical Parisian skincare line based on a harmonious blend of plants and pure essential oils.” Sounds good to me so I bought the serum, night and day creams. The serum is very light but a little goes a long way. 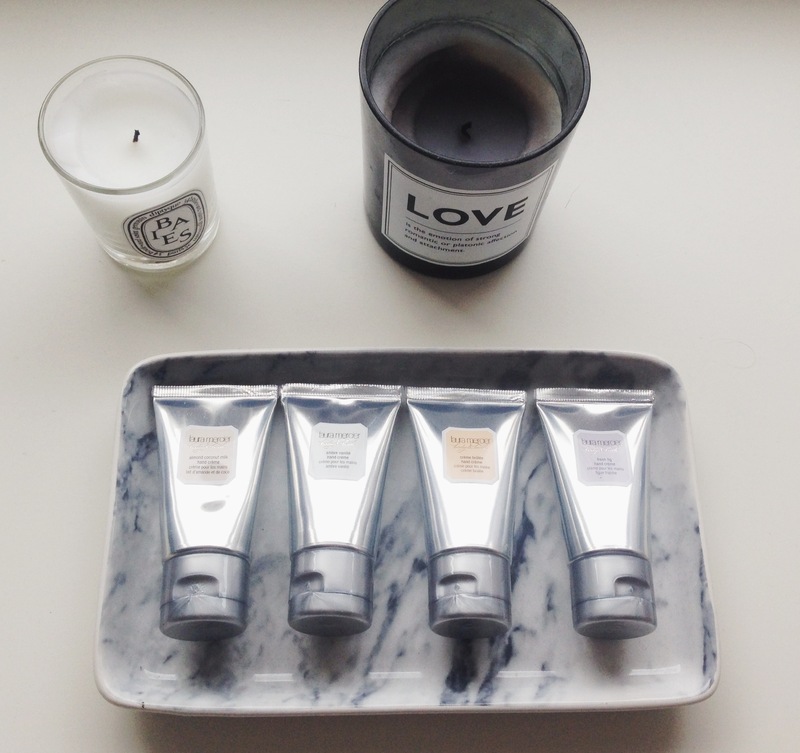 The creams both have a wonderful texture and are quickly absorbed by the skin – again you don’t need to use much, so while they weren’t exactly cheap the pots should last quite a while. I’ve only been using the products for a week and a half but already my skin looks brighter and maybe a little smoother. I have very pale skin which can look pasty in winter, matching the dull grey weather perhaps, but not exactly uplifting when looking in the mirror. I’m forever searching for a fake tan that will add a hint of colour without any orange undertones. The sales lady at Space NK suggested I try the Xen-Tan daily face tanner and it’s just what I wanted. In the winter I only use fake tan on my face, neck and decolletage but I plan to buy the body lotion as soon as the weather is warm enough for bare legs. The Elizabeth Arden Eight Hour cream is a sample I received a while ago but it’s great at keeping chapped lips at bay. I also try to use a face mask once a week but I don’t stick to any particular brand. 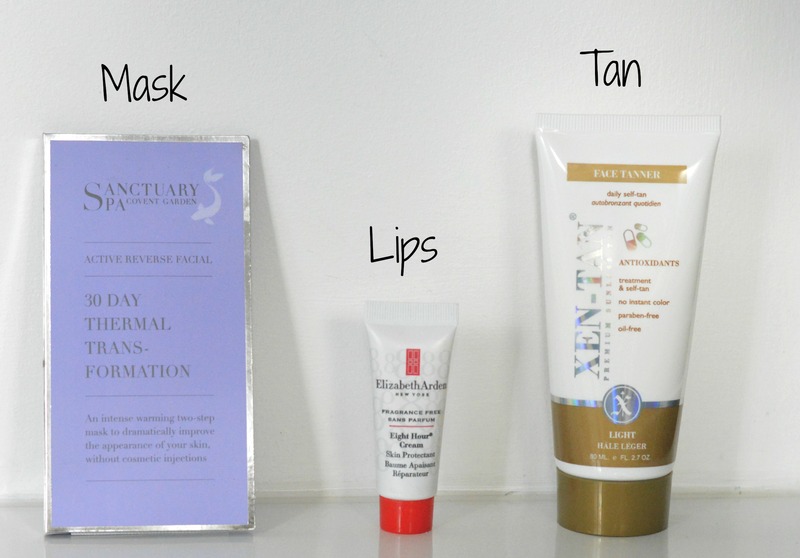 This Sanctuary Spa mask was another sample (from a Glossy Box last autumn I think) that I have yet to try but I’m intrigued by the fact that it heats up on your skin! 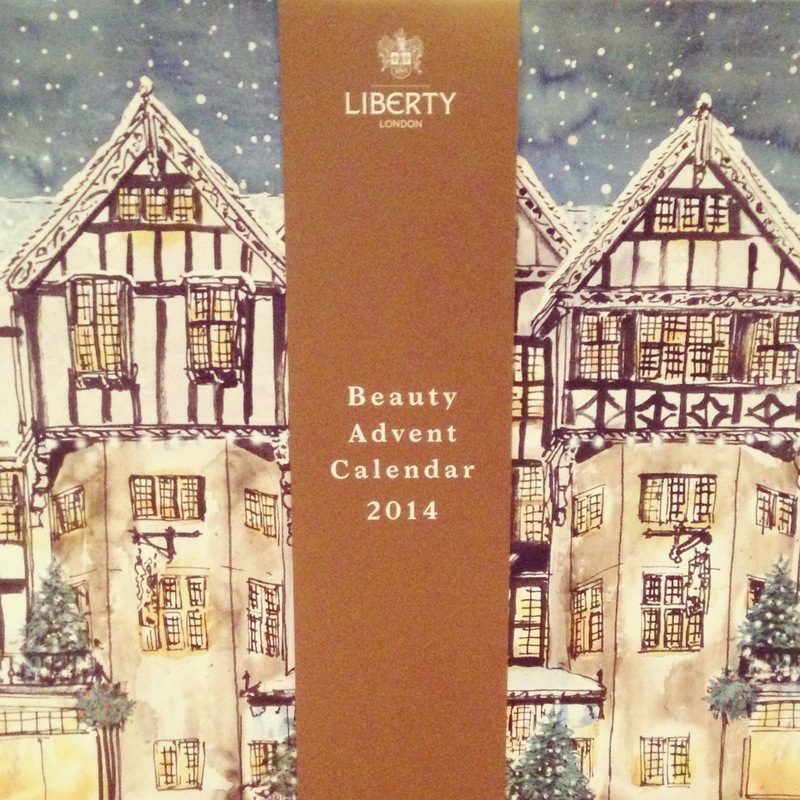 And that’s it – eight products in total to (hopefully) keep my skin looking its best. 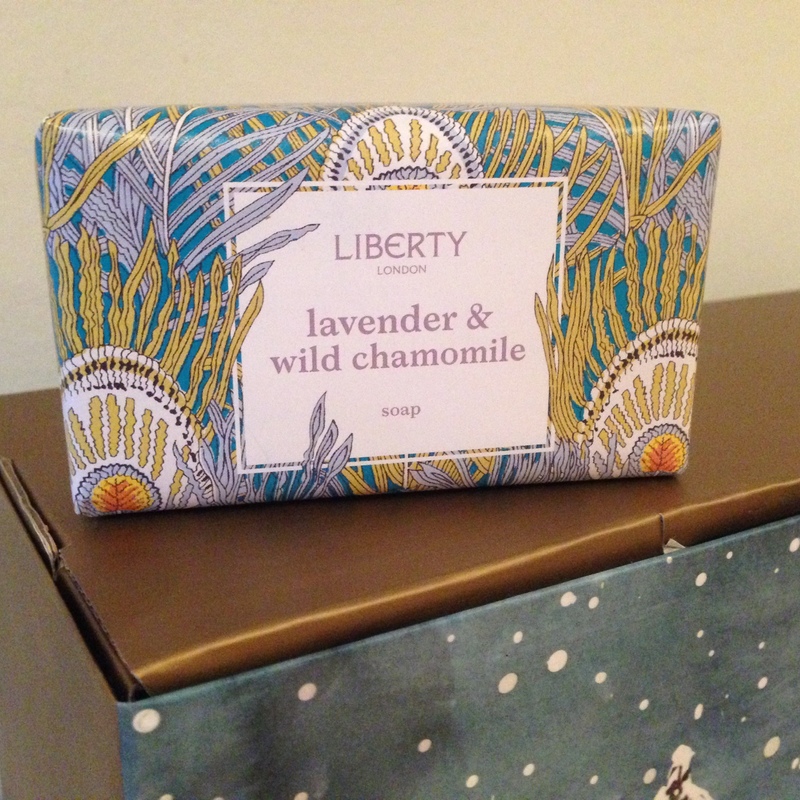 As I get older I’m finding that I would rather spend more on a few products that really make a difference than clutter up my bathroom cabinet with bottles and jars I rarely use. By the way, I don’t know if any of you have had problems with WordPress today. It doesn’t seem to be working on my computer so I had to write this on the iPad which took over an hour… Hopefully it will be back to normal this evening. 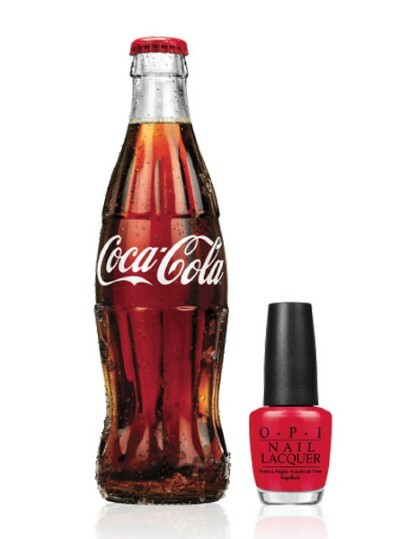 It might seem like a crazy collaboration at first glance but soft drinks giant Coca Cola has teamed up with OPI to launch a line of nail polishes. The seven shades are inspired by the iconic packaging of some of our most popular carbonated beverages such as Coca-Cola, Diet Coke, Coke Zero, Cherry Coke, Vanilla Coke, Sprite and Fanta. The new line will hit shelves in June, so this summer we could be sporting cheerful Coke red talons while quenching our thirst with ‘the Real Thing’. 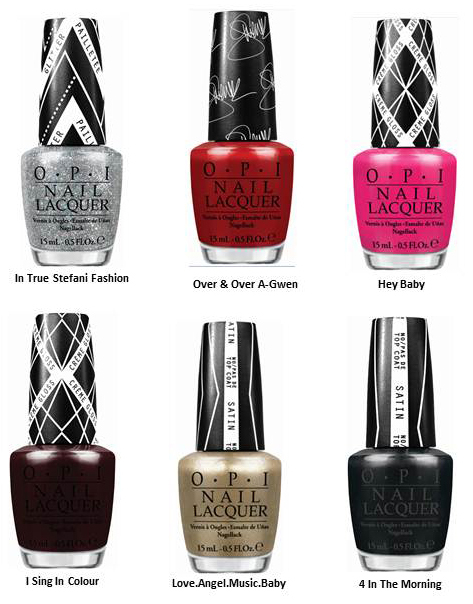 This latest link-up follows OPI’s collaboration with singer and fashionista Gwen Stefani on a capsule range of punk inspired colours. From the hot red Over & Over A-Gwen to the charcoal satin 4 in the Morning and the pale gold Love.Angel.Music.Baby (named after Gwen’s fashion label L.A.M.B), the colours epitomise Gwen’s unique style. I’m the first to admit that I’m no Eco warrior – I wear leather, I eat meat (I’ve even been known to visit McDonalds from time to time) and although financial constraints mean that we rarely have more than one or two holidays a year, we usually travel by air when we do go away. Increasingly, however, I find myself buying organic and/or locally sourced food produce and, having worked in the fashion industry, I prefer to buy my clothes from retailers who (at least claim to) have measures in place to ensure a sustainable supply chain. 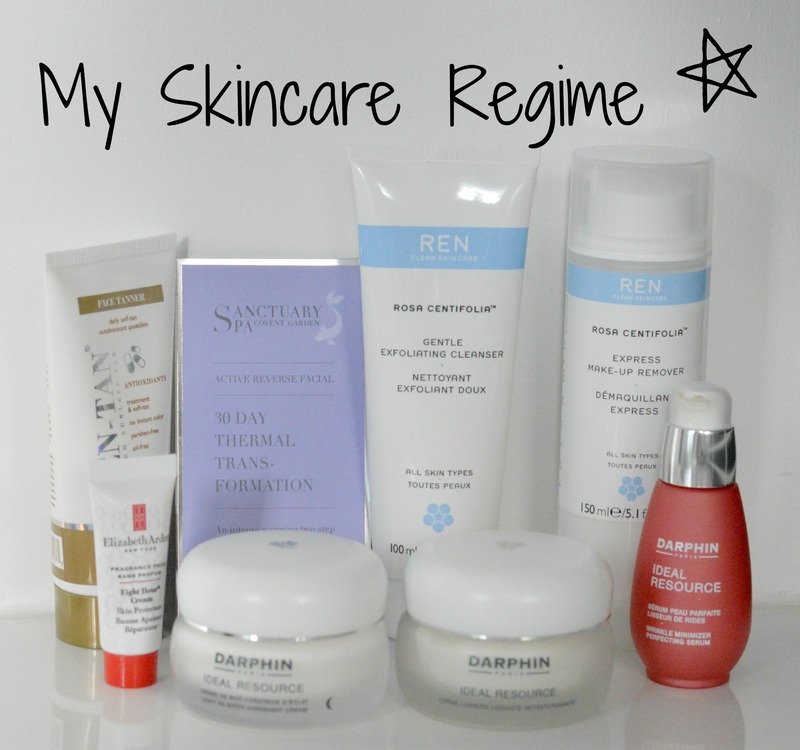 Recently, after reading this post on The Everyday Spa blog, I started questioning what’s in the products we use on our skin and hair. 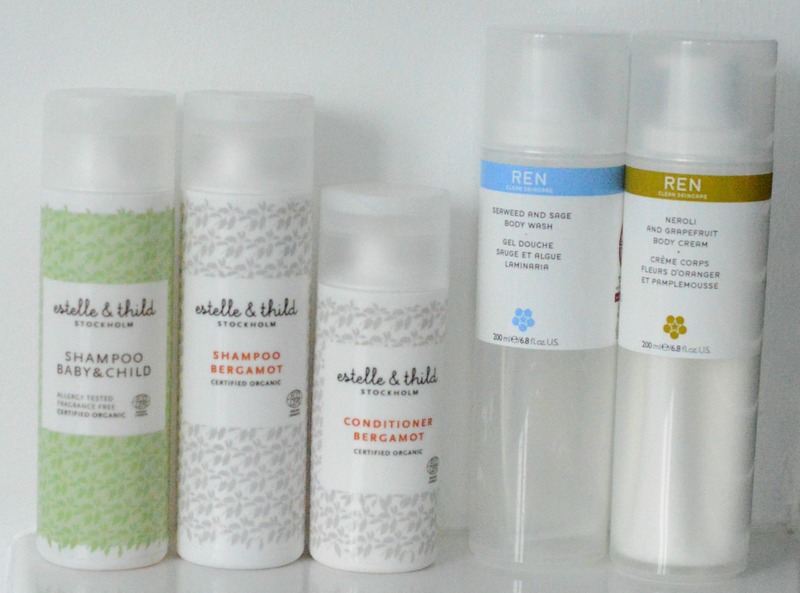 As luck would have it, I came across the post at the same time as my shampoo and other beauty paraphernelia were running out so I decided to try some brands that don’t list any of the nasties in their ingredients. The shower gel and body lotion from REN (which incidentally means ‘clean’ in Swedish!) are gorgeous and last for ages. Since its launch in 2000 REN has become a cult favourite amongst beauty editors and consumers and is now available in department stores, pharmacies and spas in over 50 countries around the world. The brand uses only 100% plant and mineral derived actives and is free from skin-unfriendly synthetic ingredients such as synthetic fragrance, petrolatum, sulfate detergents and parabens. 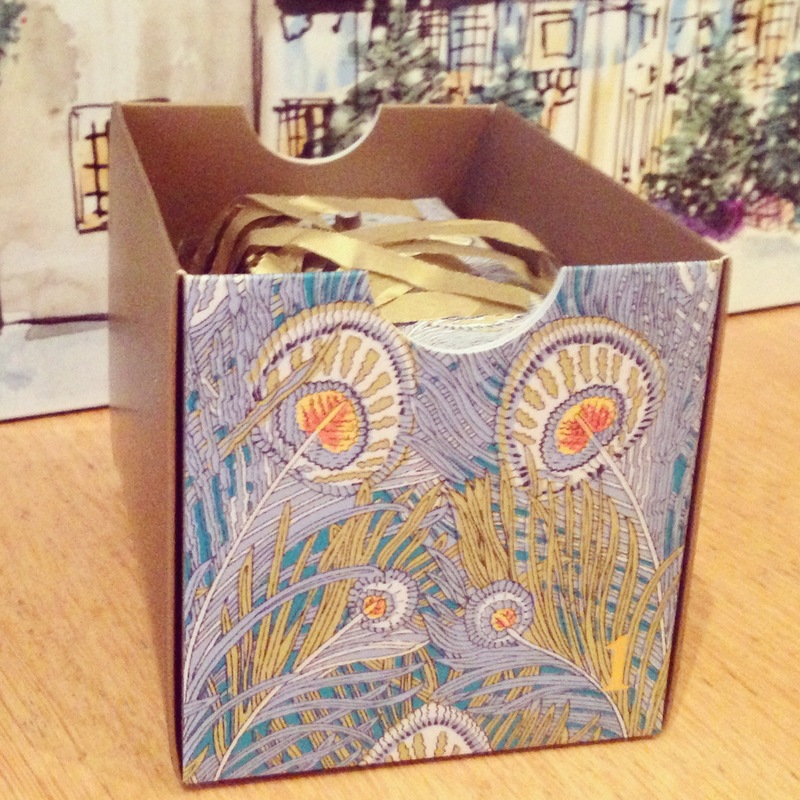 I have written previously about Estelle & Thild and I cannot recommend their products highly enough. While the Bergamot shampoo does not lather as much as my regular shampoo, it left my hair feeling clean and smelling delicious. The Baby & Child shampoo has been a big hit with the kids – again, as with the REN products a little goes a long way. The products are a bit more pricey than what you’ll find on the high street (particularly the supermarkets) but as I don’t use a huge number of hair and skincare products, I can live with that. So now, over to you – do you ever look at the list of unpronounceable ingredients on your shampoo or shower gel and wonder what on earth you are putting on your body? Or are there, in your view, more important things to worry about?